March is National Reading Month. March 21 is World Poetry Day (it's also a very special girl's birthday--our youngest daughter Emma Grace). Why not explore poetry and literature with lessons plans from the creme de la creme--the Nobel Prize laureates? Here are lesson plans for reading "around the world" with Nobel Prize for Literature Laureates. In middle school and especially in high school, use these lessons for literature, social studies, history, world religions and cultures classes. My one objection is that multicultural as the prizes are, there have only been 12 women literature laureates in the 112-year history of the Nobel Prize. Those are odds we ladies need to even. Here are famous women laureates and poets: Nellie Sachs, Emily Dickinson, Maya Angelou, Elizabeth Barrett Browning, Emma Lazarus to name a few. 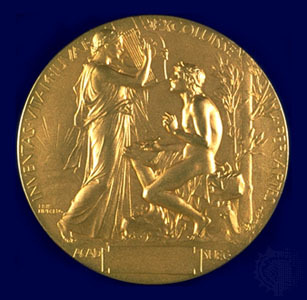 Since President Barack Obama won the 2009 Nobel Peace Prize, Americans have become focused on the Nobel prizes. Here are lesson plans for reading 'around the world' with Nobel Prize for Literature Laureates. In middle school and especially in high school, use these lessons for world literature, history, world religions and world cultures classes. I've made a list of some former winners of the Nobel Prize for Literature. 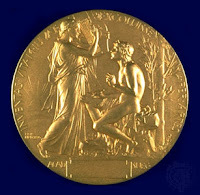 I have included Nobel Prize winners from around the world of all cultures. I recommend that students be assigned to choose a Nobel Prize winning author and read one or more of her works. If each students selects a different author, you can theoretically read your way around the globe as a class. Keep a large wall map with small Sticky Note arrows to point out the different places that the various Nobel Prize authors were born, lived and worked. I've arranged these authors in order from the present back to the inception of the Nobel Prize in 1903. As far as possible, I've tried to list volumes or works of literature for which these authors are best known. 2006:Turkey, Orhan Pamuk "The Black Book"
2001:Trinidad, Sir Vidiadhar Surajprasad Naipaul; "A House for Mr. Biswas"
Use these lessons in your world literature class.